Just a quick note to follow-up on the latest development about New York Times plan of introducing a paid model for its online newspaper. Â It is now official, NYT will be rolling out the paid-metered model beginning in 2010. The metered model approach to making its loyal readers pay for their access to the New York Times will give users free access to a set number of articles per month. NYT will start charging users online when they’ve access more than the number of free articles. Â According to NYT, this is their way of creating a second revenue stream that will somehow help in preserving the online newspaper. Furthermore, offering the NYT online on a paid subscription basis will also give them the flexibility to keep an appropriate ratio between free and paid content – hence helping them stay connected to the Internet. To prepare the online NYT, new online infrastructure will be designed. Â The good news is, Â those who subscribe Â to the print NYT will continue to have free access to the online NYT, even when the paid model system is already implemented. NYT Chairman Arthur Sulzberger expressed confidence that the loyal NYT users would not mind the paid model since it will help the NYT improve on its content. Pricing and other details about the new paid model will be released in the coming months. In the meantime, you’ge 11 more months of free access to the NYT online, so make the most of it. The Wall Street Journal and Financial Times both charge for access to their online publication and seem to be working along fine. So, I don’t really see any reason while New York Times won’t succeed as well. But to be honest about it, Â Im really hoping that NYT’s plan will not push through. I’m not subscribed to both WSJ and FT and was glad that NYT’s online newspaper is still free. But then it’s all business decision, so be it. The New York Mag is running a story about New York Times Chairman Arthur Sulzberger close to announcing that NYT will start charging for access to its online publication. Â Actually, there has already been an internal debate going on as to what payment scheme that the paper will adapt. It was a choice between the WSJ-type subscription scheme or the Financial Times’ metered system wherein readers are asked to subscribe after being offered a number of free issues. The decision as to which payment model that it will adopt is said to be announced within a matter of days while announcement of the plan is set to be made within weeks. So, if push comes to shove, by next month or early March New York Times we may no longer be able to access the New York Times online for free. There are other considerations that are yet to be resolved within the management of NYT, conflicts to be ironed out and both major and minor kinks that could spell out the demise or the continuation of the online newspaper. In the meantime, let’s all take advantage of the NYT while it still remains free. But should the plan paid subscription push through, will you be willing to pay for it? The New York Times, a widely read newspaper also known as the â€œOld Gray Ladyâ€, has decided to cancel its pay-for-access system to some news columns and make it accessible to all online readers. It means avid readers donâ€™t have to pay $49.95 annually or $7.95 per month just to read the articles from popular columnists like Thomas Friedman, David Brooks, and Gail Collins. Apparently the existing marketing plan limits its online advertising revenue potential. Although it is generating about $10 million annually, the company admits they failed to consider the impact of massive indirect traffic coming from different search engines like Google and Yahoo! What we have is a win-win solution both for The New York Times and its avid readers. We get to read the finest articles while allowing the newspaper to earn more. Itâ€™s interesting to know how the 227,000 paying subscribers reacted to this recent development. 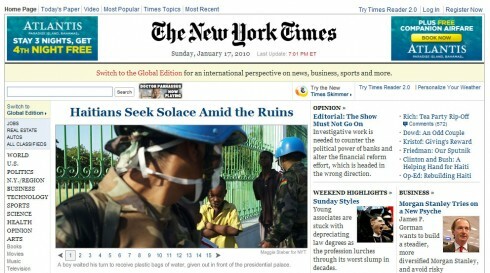 The New York Times today unveiled a blog on their Web site targeted towards all things New York. The City Room, as the new blog is being called, will be manned by Sewell Chan, Times Metro reporter and will draw upon the resources of The Timesâ€™s one hundred-plus-person Metro staff for content. The City Room blog will, according to the New York Times, provide depth reporting from each of the city’s five boroughs. Reports will also be drawn occassionally from the suburbs. Examples of topics covered will include “government and politics; crime and public safety; schools; transportation; housing and economy; and people and neighborhoods.” It will enhance and supplement Metro articles from The Times, offer non-news features about the history and civic culture of the city, and encourage reader comments and discussion. Features of City Room will include expanded Times photography, Web videos, news profiles on neighborhoods and original documents and Web resources.